This section explains how to compare data in a backup file with that of the production state. In the navigation pane, select an object and click Compare with Production on the toolbar. Proceed to Specify Credentials to authorize yourself in the production environment. Authorization is only required when the account you are using does not have sufficient privileges to access the production environment. After the authorization process is complete (if required), click Show Changed Items Only on the toolbar to view only those items that have been changed. To view the details on what exactly has changed since the last backup, right-click an item and select Compare item properties. The discrepancies will be shown in the Compare Message Properties Window. If both objects are equal, nothing will be displayed. 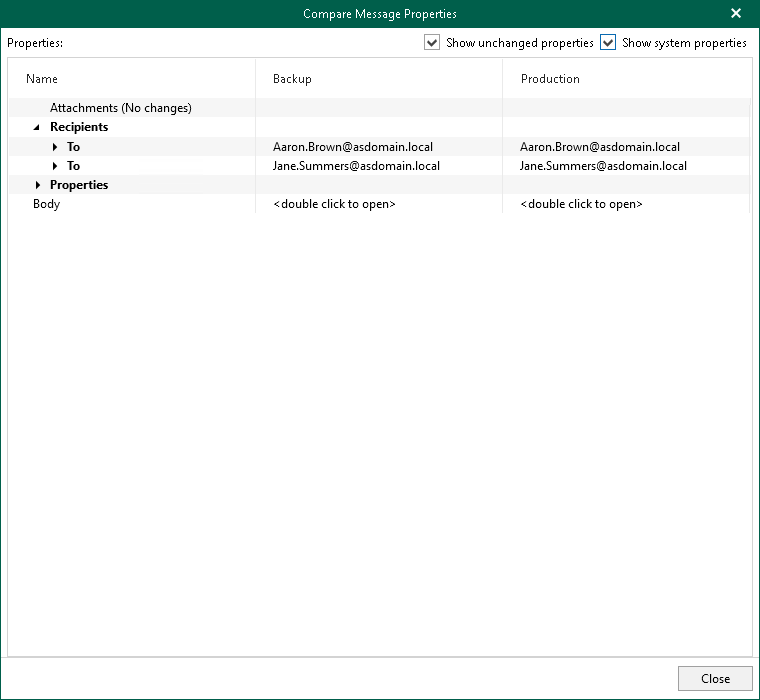 To show unchanged objects, select Show unchanged properties in the top-right corner. To show system properties, select Show system properties. Double-click Body to see the body message. To compare a single item, right-click an item and select Compare item properties.